PDF creation and editing is not an easy task when you are considering to make something with zero knowledge and directly put your hands on using Adobe software to create it. 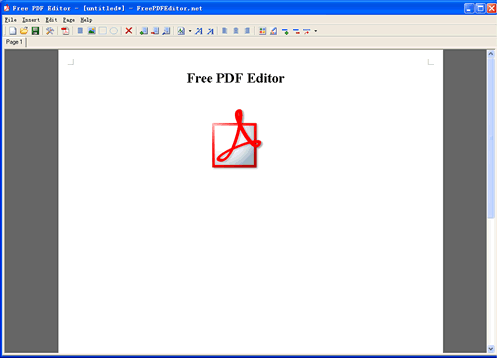 To create or edit a PDF file, which is generally the format chosen by people to create ebooks and tutorials etc., a simple program can also help, one of them is this Free PDF creator. When you are done with all the text, images and page options, you can just hit F9 and the PDF file gets created at your destination folder which you choose. Its a very simple and easy to use software. It does not need any installation and can be used from anywhere, local computer or through USB flash drive. The images that are supported by the program are – BMP, JPG/JPEG, GIF, PNG, ICO and more. You can use “Insert Rectangle” and “Insert Ellipse” to add some shapes in your PDF files, you can change the border size, border color, border style and fill color, if you choice the white color, it will be transparent. You can modify more things like name of the author, date of creation, keywords, modified date etc. A very simple and neat alternative to the Adobe PDF editor and creator that I have used online. Another way how I create PDF is that I create the docs and then convert them to PDF.